Versature is the go-to VoIP service provider for businesses in the Canadian marketplace. The cloud-based solutions provided by the company are flexible, widely trusted, and feature-rich. The company was founded in 2003, and since then, it has maintained its status as a market leader in the industry. Versature also won the Growth 500 Canada’s Fastest Growing Companies award in 2018. This package costs $29.99 per month and also includes free phone rental on 3- or 5-year contracts. You can make unlimited calls to U.S. and Canada, and conference bridge is also included in this subscription. This package comes with 5,000 toll-free minutes. with 1,000 conference bridge minutes and 10,000 toll-free minutes. If you are looking for a customized solution that caters to your specific set of business needs, then you can get in touch with the company to get a personalized quote. Versature comes full of a handful of useful features to make your VoIP experience seamless and efficient. All Versature packages come with a client portal that can be accessed by anybody in an organization. From creating reports for important call statistics to managing application users, you can do it all from SONAR, the user and administrative portal. All Versature packages come with a voicemail to text feature. This allows you to get your voicemail sent to you in text form via email. Versature also integrates seamlessly with famous enterprise applications like Salesforce, Slack, and Klipfolio. This is particularly beneficial for companies that like to keep all departments in sync with each other. Both professional and enterprise packages come with the traditional conference bridge feature. This makes it easy for teams to collaborate effortlessly across departments. For a small additional fee, Versature also provides you with the ability to get all your faxes sent to your email. Call recording is another excellent add-on feature that is available for users of every package. Versature also has smartphone applications for both Android and IOS applications. This is a must-have feature for companies that can’t afford to be unreachable. Getting started with Versature is a breeze. Simply call an account manager via landline and request a new connection. The provisioning team configures all your phones, extensions, and systems before dispatching them in a carefully packaged box. All required items get shipped to your location with phones pre-labelled for each employee. To use the phones, you just have to plug them in. Yes, they are indeed plug and play. Versature has a highly responsive, friendly customer support team that can be reached via email, live chat, or phone. The YouTube channel is also home to some informational videos, and the company also maintains an online blog. The only con is that there is no dedicated FAQ section. The Versature team can be reached 24/7 for support. The Versature team can be reached via local and toll-free numbers. Versature customers can dial 611 from their Versature device to get connected to a support agent. The Versature team can be reached via live chat. You can reach the Versature customer support team through email. A few videos are present on the Versature YouTube account. No, a dedicated FAQ section is not present on the website. 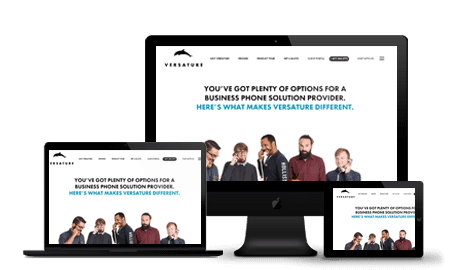 The Versature team maintains an online blog. Versature is an award-winning, trustworthy cloud-based VoIP solution provider offering services in the Canadian marketplace for over a decade. Their solutions are flexible, easily scalable, and also affordably priced. Their customer support team is very friendly and highly responsive.